The story of Whittle Springs, for it was at Whittle that the spring was discovered, has its own fascination and begins in the year 1836. At that time (1836) a certain John Heyes was boring for coal on the land he owned alongside the Leeds and Liverpool Canal on Lower Lane Whittle (Lower Lane has since been named Dark Lane). 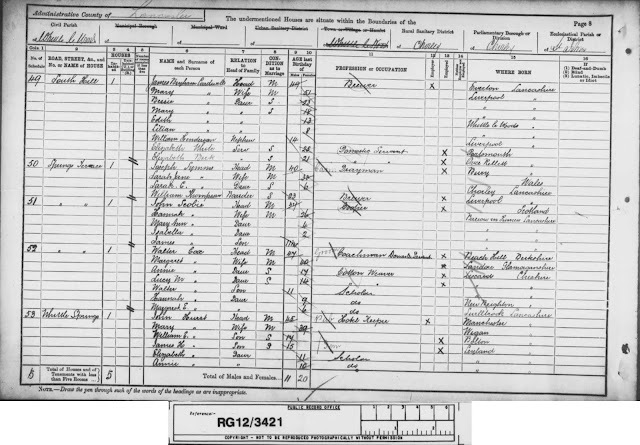 He was an astute and wealthy business man the son of a calico manufacturer. 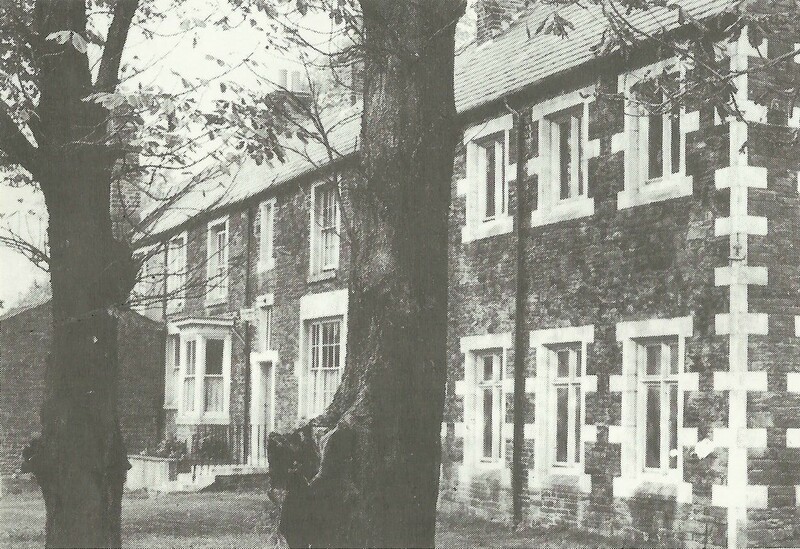 His residence, Gorse Hall, on the old Chorley to Blackburn road, was a typical 18th Century gentleman's residence, stone built with three floors. 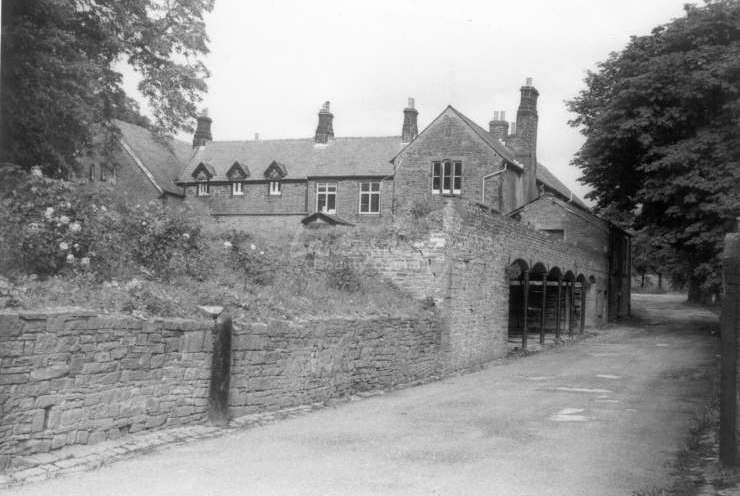 Sadly, apart from an old archway within a broken wall, nothing is left for the house was demolished in 1970. 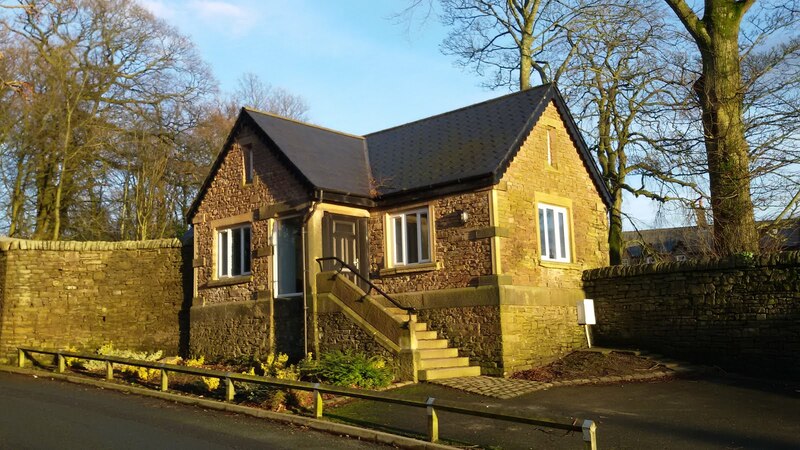 There is however a wonderful contemporary description: "Gorse Hall is pleasantly situated, commanding one of the most extensive, beautiful and picturesque views in the county. To any Gentleman fond of field-sports it is most centrical, encompassing hunting, coursing and fishing in its immediate neighbourhood." Before long the boring in Lower Lane had reached the depth of 90 yds. A silver Denarius of Roman origin had been discovered, with Hygeia on the obverse of the coin - a singular find in the circumstances, denoting not only a Roman past but portending somehow, in the figure of Hygeia goddess of health, the Spa that was to come. At this point in time, water started to gather in the workings and, following an accident of some sort, the project was abandoned. In 1841, an effort was made to clear the blockage in the borings, but this resulted in an even greater flow of water. When it was realised that the workmen had accidentally tapped a spring, the borings were once again abandoned - and there the story might have ended. Legend has it however, that some years later, in December 1845, John Heyes was out for a days walking in the Whittle area with William Brigham of Foxley House, Lymm. The two friends stopped and drank from the spring water still bubbling from the old coal workings. Brigham, who happened to be an F.R.C.S, noticed the strange medical taste of the water and offered to have it analysed. It must be borne in mind that at this time, spas and healing springs were all the rage. It would have been a dull man indeed who did not realise the potential of a medicinal spring and, as has already been noted John Heyes was nobody's fool. A Mr. Davies, a lecturer in Chemistry at Manchester University, duly analysed the water sample sent to him by Mr. Brigham. He confirmed its alkaline content, much to the delight of the two men involved, for the springs containing carbonated alkali are rare and are almost entirely free of earthy substances. John Heyes lost no time in enclosing the source of the spring water with a circular stone building topped by a dome shaped roof- a structure much resembling that surrounding the Teewit well in Harrogate. Inside three steps, wide enough to sit on ran all round the inside of the building and led down into the water.. The latter bubbled from a 9" pipe in the centre of the floor at 50 gallons a minute before being drained, initially into a horse trough on Lower Lane and from there into the canal. Judicious publicity and word of mouth brought several thousand visitors, to taste the spring water, in the first two weeks of the spring being open to the public. To the poorest the water was free, the rest paid a penny. By the September of 1846, only nine months after the springs discovery, news of its beneficial nature had reached as far as Liverpool. A gentleman writing in the Liverpool Journal extolled the spring saying he preferred it to either Cheltenham or Harrogate, he likened the water to that found at Baden-Baden and recommended it those, "afflicted by bilious complaints, rheumatism, ulcers of the lower extremities, scrofula or to those who have acquired a relaxed system by residence in the Indies." Apparently the water, whether taken internally or applied externally, was equally beneficial. A further spring was found "some 100 yds away", a chalybeate spring this time. Unfortunately there is now no means of telling the exact location of this spring and in case, it was the alkaline spring that received all the attention. Although several distinguished physicians visited the spot and praised the efficacy of the waters, Brigham, who undoubtedly had a stake in the discovery, made by Heyes and himself, lost no time in following up certain cases. He fully realised that claims would have to be substantiated in order that the spa should continue to prosper. In a letter dated. Jan. 1847, Mr. Brigham wrote to John Heyes of two cases in particular. - William Critchley (58) This man had been ill for two and a half years. "He had no appetite and severe pain on his right side was accompanied by sickness and vomiting. " According to Brigham's findings, "the water acted on all his recreations and produced free and copious perspiration." 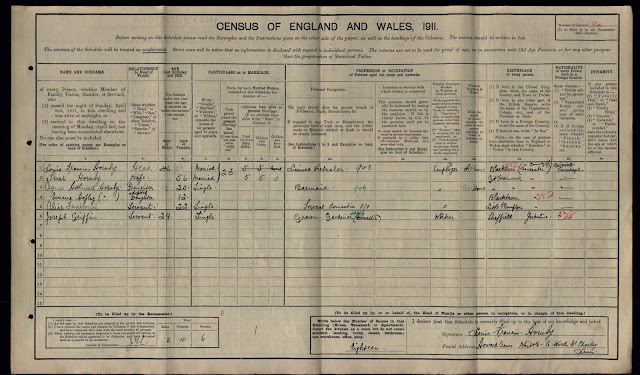 Within three months he was back at work as a weaver,Anne Haworth (25) lived in a small cottage in Whittle. She had been ill for 14 years and confined to bed for the last five. She had suffered from painful ulcers, gradually increasing in number and extent. These were situated "on her back and limbs" and there was "much sloughing of the skin and discharge. " She was instructed to drink three to four pints of spring water daily and the affected areas were regularly wrapped in bandages soaked in spring water. Two months later, she was much improved and was able to walk and work a little. John Heyes meanwhile, was delighted that his spring showed no signs of diminishing, and continued to pump out not less than 50 gallons per minute. He therefore pursued his plans still further. By 1847 he had built two plunge baths. 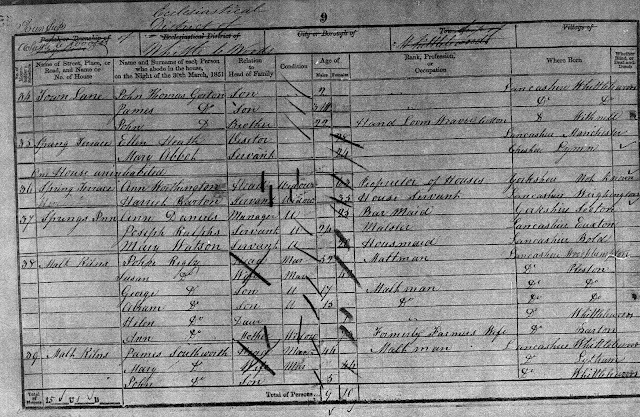 The gentlemans' was 18ft long, 19ft wide and 5ft 6incs deep. The ladies plunge bath was 16ft long and 14ft wide and 3ft 6incs deep. 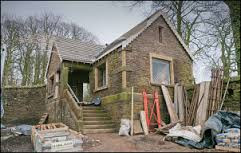 A further building was eventually added to contain a tepid bath, this was 15ft square and had underground heating. 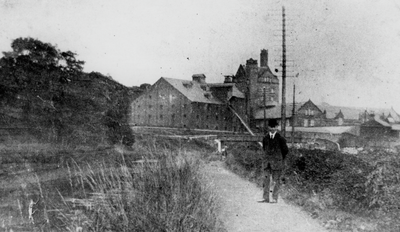 In addition John Heyes built a new hotel at which visitors could stay whilst taking the cure. This he called "The Heyes Arms" It was built in the revived Gothic style made fashionable at this time by the designs of Pugin and Barrie for the Palace of Westminster. 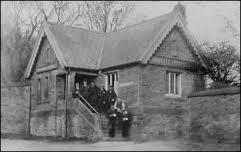 Amongst the many attractions to be found at this newest of Spas was a tearoom adjoining the tepid bath and a large public hall where, before long balls were being held during the winter months. Other facilities eventually included angling, quoiting, cricketing, pleasure boats, gymnastics, archery and a bowling green. A porter's lodge (known locally as the "Wap") was built at the entrance to the "Heyes Arms" where people paid to sample the spa and to enjoy the diversions provided inside the pleasure grounds. A little higher up lower lane a tower, surmounted by a flag pole, was constructed in the boundary wall and visitors to Whittle Springs could climb the steps and enjoy the view Westwards towards the Lancashire sea coast. Sadly this tower is no longer in existence, although part of the base can still be seen. The Wap, Dark Lane, Whittle Springs. To celebrate their 25th anniversary in 2010, Peck Properties commissioned local bespoke construction specialist Primrose, to painstakingly restore an historic building back to its former glory. Built as the entrance Lodge to visitors of the much celebrated alkaline and chalybeate spring in the 1840s, within the magnificent 5 acre gardens of the former Howard Arms Hotel, the property had fallen into complete dereliction before achieving planning approval to be refurbished. The hotel, erected by proprietor H. Heys Esq. 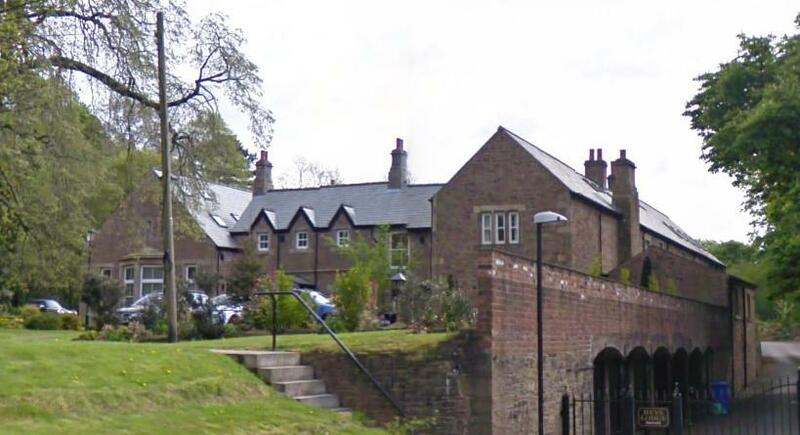 in 1847, also closed in the 1980's and is now a select residential development, Heys Lodge. The spring itself was discovered in 1836 and opened to the public in 1841. 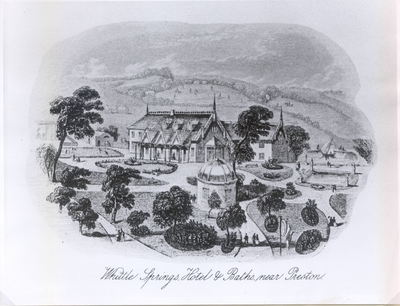 According to archivists, in Jackson's history of the Whittle Springs Brewery, "drinks of all kinds were available at the Porters Lodge for those passing by" and in the days when the canal was busy with commercial traffic serving the many nearby thriving Mills of the industrial revolution, the bargees became accustomed to buying a drink there with their boats waiting to clear in the neighbouring Jackson Locks. Hence "just wap up for a drink" was the colloquial cry and so the Porters Lodge got its nickname of the Wap, which has stuck to this day. Wap up and see it some time. In 1840's a visitor to the Spa described Whittle "next the Lake district, the most romantic and healthful spot in the country, even in Winter, the place is warm and genial". Over the chasm of time that separates us from this visitor writing in the 1840's the imagination struggles to visualise Whittle in quite such high flown terms. Beautiful it may have been, but Whittle was not prosperous. The advent of the Spa however, boosted local economy considerable, for it brought much needed local employment Workmen were required for the construction of the hotel and the various bath houses etc., staff were needed to run the place. Visitors not wishing to stay at the hotel, found accommodation with local families. 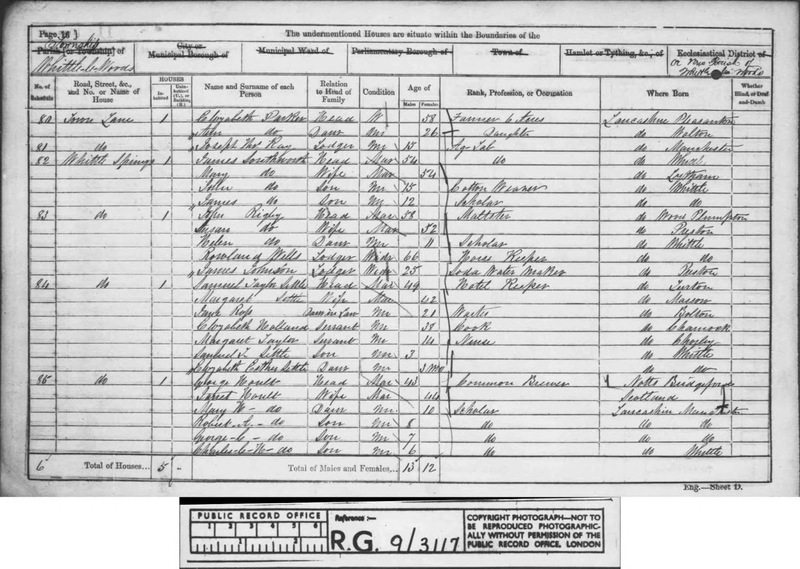 In January 1849, John Heyes and his brother Henry Heyes of Southport, rented a portion of land to Sarah Richardson, a widow from Manchester, to build a house on Lower Lane just above the "Heyes Arms". This house, originally known as "Horse Trough House", still stands. There is a suggestion that it was used as a girls, school but no record of this can be found. The other theory, that it was used by Mrs. Richardson to accommodate visitors and earn herself a reasonable living, seems a more likely explanation. Several other large houses were built in the area by wealthy people wishing to use the facilities of the Spa on a more regular basis. Roads in Whittle were probably improved to deal with the increasing traffic. 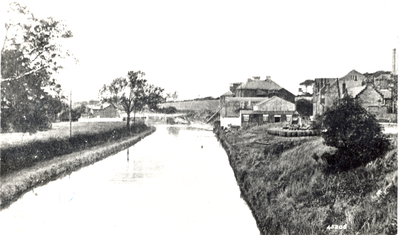 As well as on foot and by carriage people arrived by pleasure boat along the canal from Wigan and Blackburn. 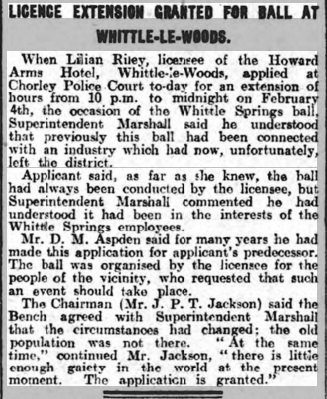 Visitors from further afield travelled by rail to Chorley where a large notice read "Change here for Whittle Springs." At this point horse drawn omnibuses were laid on to complete the journey from the station to the Spa. Sadly, John Heyes died in 1849, only four short years after he and his friend, Brigham, first tasted the Spring water, but he had lived long enough to see his dream come true. Nobody now could doubt the overwhelming success of his enterprise. His estate was left to his brother Henry Heyes, under whose proprietorship the Spa continued to prosper. Listed landlords at the Howard Arms were Ann Daniels (1851), Samuel Settle Taylor (1861-71), Daniel Stansfield (1881), Sarah Stansfield (1881), John Hurst (1891), Edwin Drake (1901), Louis Francis Hornby (1911) Ralph Rainford (1920's) and Lilian Riley (1931). Malt Kilns existed on the opposite side of Moss Lane bridge long before the discovery of spring water in this part of whittle. They were probably erected when the canal was built in 1795 for they were conveniently situated along its bank. A further kiln was to be found 200 yds along Lower Lane, beside Tan House Brook. Worked by Edward Craven, these kilns are thought to mark the site of the oldest breweries in Lancashire. Previously it had been the custom for brewing to be carried out at farms and inns, not at sites deliberately chosen for the purpose. Drinks available at the " Heyes Arms " therefore included not only the spring water itself, but also ale, porter, ginger beer, soda water, lemonade and exhibition waters. 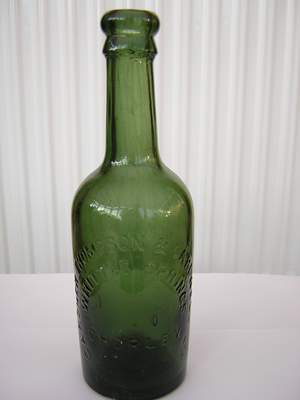 These were almost certainly prepared by Edward Craven and Co, who became known as the Whittle springs Brewery Co. Indeed it seems likely that Edward Craven had some deeper involvement with the Spa because following the death of John Heyes, he was allowed the use of the land on which the brewery stood, rent free. These three, owners of the Crown Brewery, began building a new brewery in the Gothic style to match the "Heyes Arms" or the "Howard Arms" as it was now to be known. 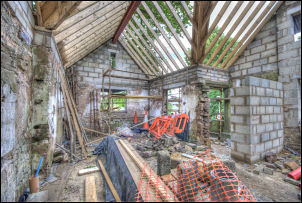 A "rearing dinner" was held at the hotel when the roof timbers of the new buildings were finally in place. - To celebrate the arrival of the most extensive brewery in the whole district. It was not long before agents for the firm were found in Liverpool, Southport, Barrow - in - Furness and Lancaster. The local public houses like the "Sea View" at Whittle and the "Bay Horse" in amongst others proudly carried a header board proclaiming they sold "Whittle Springs Noted Ales and Stout." There again, houses in the Whittle Springs area that had previously been connected with the Spa, were gradually acquired for various members of the brewery work-force. Horse Trough House for instance, was acquired by the brewery in 1883, divided into three dwellings and renamed Spring Terrace. New houses also were built specifically for key workers at the brewery. 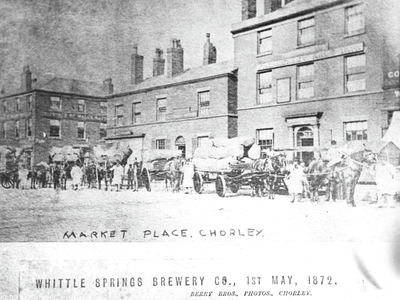 Such was the popularity of Whittle Springs ales and mineral waters by 1883, that the brewery owners required further spring water to keep up with the demand. Several wells had been dug over the years but on this occasion they sunk a deep artesian well in the brewery courtyard and were rewarded with a flow of 4.000 gallons an hour, far more than they expected. They took what water they required and the surplus was allowed to drain away into the canal. All this would have been of no consequence were it not for the effect the new well had on the original Spring in the Round House. This, the source of so many past cures and the original of so much success and wealth, now dried up completely. Eventually, when it was obvious that the water would never return, a troop of monkeys was kept in the Round House and to future generations of children it became known simply as "The Monkey House." Nobody in 1883 would have regarded the failure of the original spring as having any particular significance. Nevertheless, until this point in time, the Spa and Brewery had been considered of equal importance. Henceforth, the brewery and its needs were to take precedence. Gradually, almost imperceptibly, the number of visitors to the Spa declined, particularly amongst those who had been accustomed to travel considerable distances to take the water. All the diversions to be found at the "Howard Arms", the pleasure grounds, the beautiful conservatories, and all the facilities previously described, could not compete with the more intellectual attractions of Harrogate, Buxton and Cheltenham. There again, science was advancing. The efficacy of mineral water" cures" was being questioned by the medical profession. The latest fashion was for sea bathing and special trains were carrying people to resorts along the Lancashire sea-coast. "The Howard Arms" could hardly match the appeal of the "Winter Gardens" in Blackpool or the rolling breakers of the Irish Sea. 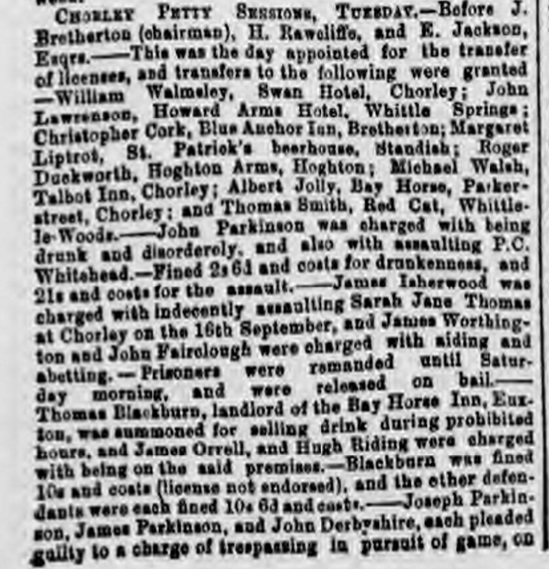 The new attitude towards spa water is reflected in this slightly mocking extract from the Chorley Guardian dated 1889. The writer is describing the kind of people who now visit the Spa; "lovers and young people fond of hired traps - young men and maidens who relish tea and conversation and moon - shine and who think they are adding to their lives by pulling faces over curiously tasting water, visit the place in Summer. They go in for doses of Chalybeate, Alkaline and Alcohol, tea, gossip and kisses and return in the long Summer evenings determined to live forever." Nevertheless the "Howard Arms" continued to attract local people well into the 20th century. There were swings for the children and a boating lake. The bowling green was very popular. Brass bands played in the grounds every weekend, the fair came each year on Good Friday and the "Wap" continued to provide drinks and refreshments. It was still a pleasant place to be on a Sunday afternoon. As the Spa gently declined, the brewery became ever larger and more successful. 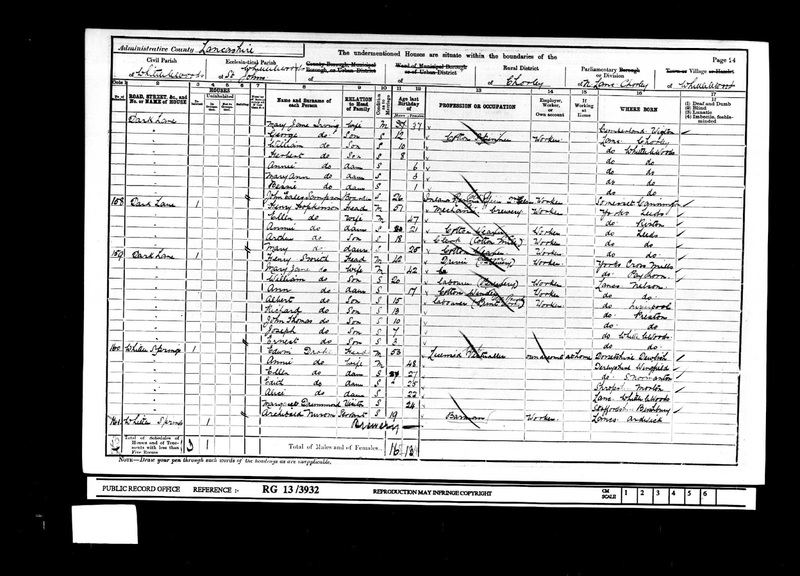 The coming-of-age of the eldest son of James Thomson was held at the "Howard Arms" in March 1889. 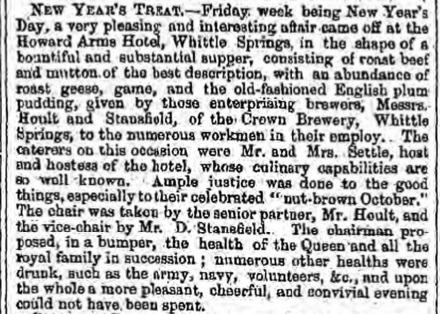 It was attended by at least a hundred people who enjoyed lunch and afternoon tea at the hotel. A photograph of this occasion, taken in the grounds of the "Howard Arms" clearly shows a handsome stone lion on the banking behind the assembled guests. 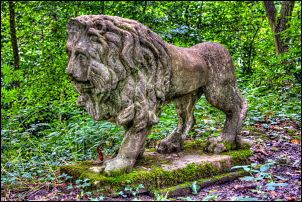 I mention it because the lion has been a great attraction at the Springs over many years. Where he originally came from, nobody seems to know, but countless children have clamoured to ride on his back and no doubt he has figured in many a photograph since that day over a hundred years ago. In that same year (1889) Thomas Gardner died and the three man partnership was dissolved. 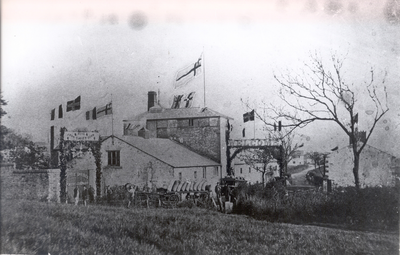 The brewery, still called the Whittle Springs Brewery, carried on business throughout the Boer War, when a tax was imposed on ale. 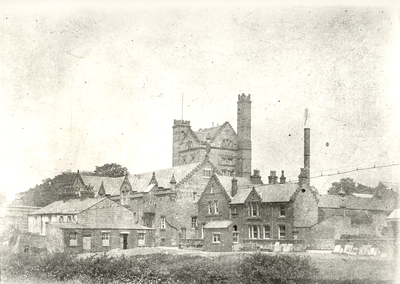 By 1909, when further additions were made to the brewery, it owned most of the property in the vicinity. 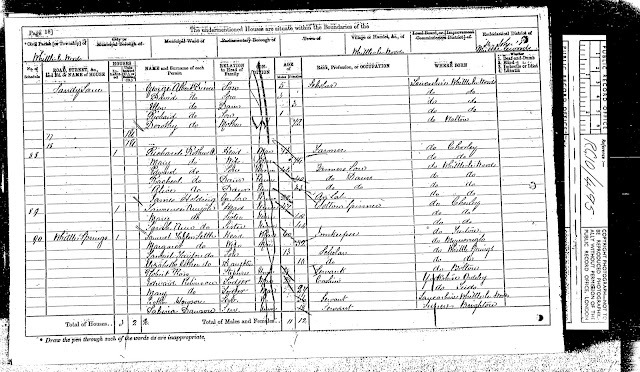 Two villas opposite Moss Lane bridge were occupied by Mr. Holland, the Secretary, and Mr. Collins who was on of the chief brewers. Two coopers and a joined, Mr. Irving, in Spring Terrace. 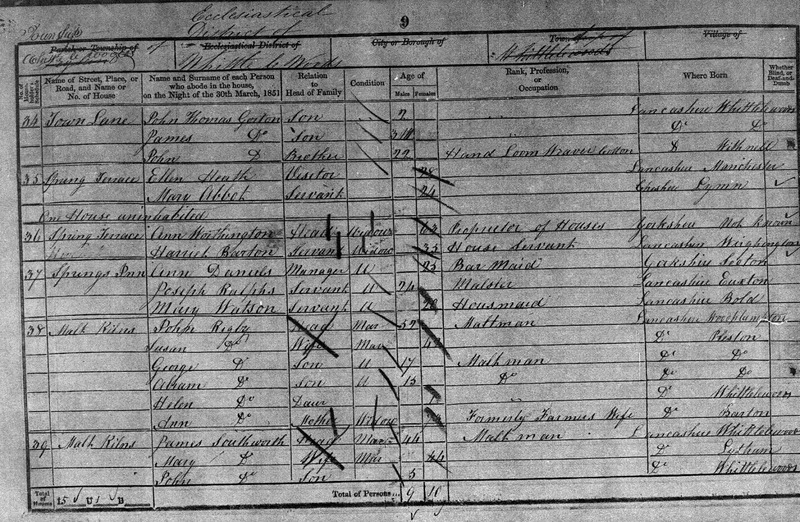 "Geenfield" a large residence on Town Lane belonged to Mr. Hugh Thwaites, a manager. The brewery now had its own Mailings. Sacks of grain were hoisted from the boats, up the chute, to the top of the building where the mailing process began, A tunnel was built under Lower Lane so that the barrels could be rolled down to the waiting barges. Because the brewery was so close to the canal, the joke locally was that Whittle Ales, known to be the strongest in Lancashire, were brewed "straight out t'cut." In the sense that the ingredients for the beer, with the exception of course of the pure spring water, all arrived by means of the canal, there was some truth in the saying. 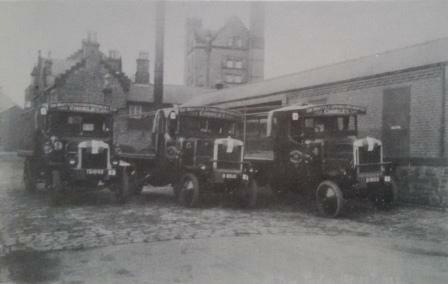 For many years , Whittle Springs was busy with the constant traffic of drays, and later waggons, loaded with ale. Monday was the busiest day because the local farmers came to buy "the grains", the brewery's waste product. These came down a chute and straight in to the waiting carts. They were driven away, still steaming, and the contents were later fed to the livestock. Horse drawn carts, laden with sand from the sand quarries behind Gorse Hall, also came to the sand wharf so that sand could be transported to Wigan Iron Works. 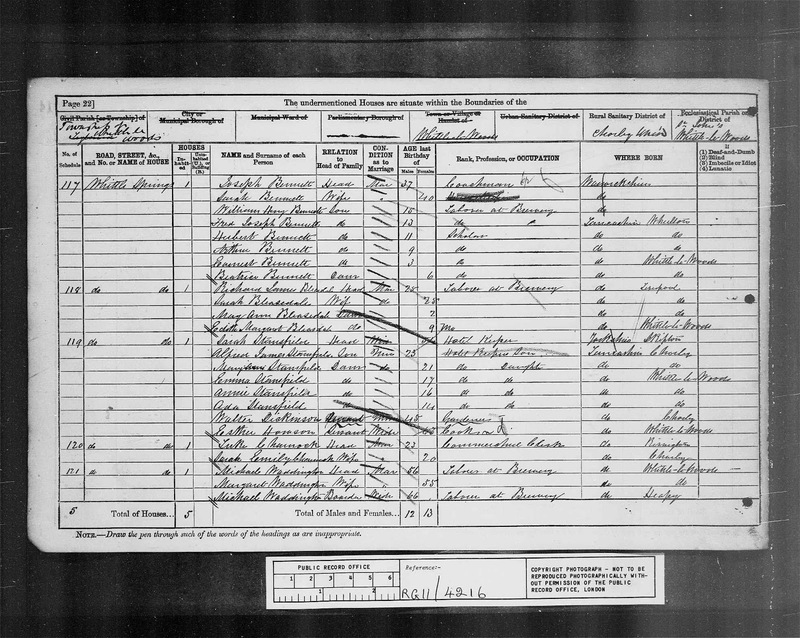 Ralph Rainford worshipped at St. Chad’s R.C. Church, South Hill in Whittle-le-Woods and not Hollinshead Street Congregational Street Congregational Church (the latter was printed in the Chorley Guardian ‘Roll of Honour’ lists c1915).He was born in Brindle in 1893 and was living at Denham Springs Farm in Brindle in 1910; he was also listed on the 1918 Electoral Roll for Brindle as an absent voter due to military service. Sometime after the war he ran the Whittle Springs Hotel (later the Howard Arms) and eventually the Mitre Hotel in Chorley.He told his family that he served in Egypt and went over the top with the Chorley Pals at Serre on the 1st July 1916.Ralph Rainford died in Chorley and is buried in St. Gregory’s R.C. Church. 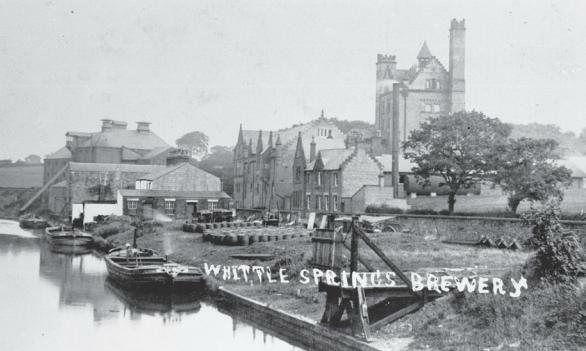 The Whittle Springs Brewery continued to prosper until 1929 when it merged with Nuttals, The latter then amalgamated with Matthew Browns of Blackburn. Noting that the equipment at the Whittle Springs brewery was becoming out dated, Matthew Browns decided to close it down. The employees were transferred to Blackburn and much of the sixty acres of land owned by Whittle Springs Brewery was sold. 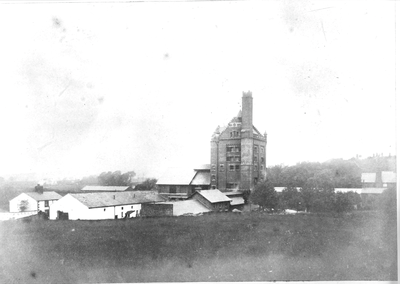 The brewery building themselves, for which there were few takers, were sold on condition they were not used for the manufacture of any "excisable liquor". As they were of little use for anything other than the production of excisable liquor, they were eventually demolished. Anyone visiting the area today will find that the "Howard Arms" as it is now known, appears to be all that has survived the rise and fall of Whittle Springs. The Hotel now owned by the Burtonwood Group, has been considerably altered and extended and is know aptly described as "a popular social and conference centre,". The little Round House stands forlornly in the middle of the encroaching undergrowth, roofless and derelict. The lion rather the worse for wear but retaining his benign expression, peers from a tangle of blackberries. Only a staircase leading to a mass of broken masonry shows the site of the "Wap" and the Tower has completely vanished. Just the other side of Moss Lane Bridge, the beautiful stable and yard lies empty, the stall once filled with great shire horses, the pride of the brewery, are silent. The original Malt Houses nearby, collapsed a few years ago and a tangled, distorted heap of slates, bricks and corrugated iron is all that is left of them. Yet all is not lost, the site of the Brewery is now, an attractive (some people say otherwise) housing development called Spring Mews. In the courtyard, stands the original brewery well. Look down and there still bubbling away to this day the ultimate survivor, the spring water itself, as pure as it was in 1846. With the present vogue for bottled spring water I am surprised that nobody, as yet has hit on the idea of re-introducing Whittle Springs Water back onto the market. Over the past few years several proposals have been put forward for the Maltings, but the cost of any rebuilding would be very high. One such proposal was that it would be rebuilt, as far as practicable, along the original lines but as a Motel with a link road from the by-pass. One of the attractions was that it would have its own small brewery. There would also be mooring facilities for passing narrow boats to "wap up for a drink", as in days gone by, unfortunately nothing so far has yet materialised. 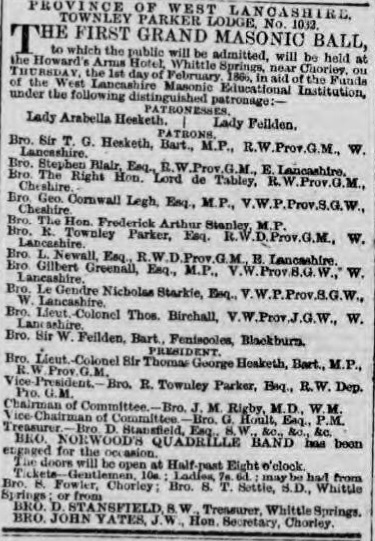 A couple have unearthed a fascinating history from an old letter which has links to Chorley. Eric Hodgkinson and his wife Marion found the dated poem whilst clearing out the home of Eric’s late cousin, Alfred Hodgkinson. 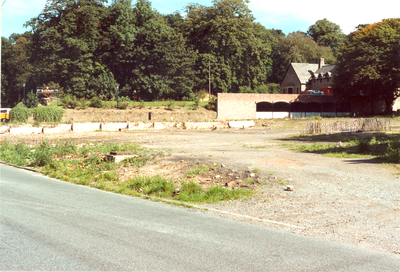 The work, titled ‘Whittle Springs – A Reminiscence’, was written by J. Stansfield of the former Howard Arms Hotel on Dark Lane, Whittle-le-Woods. Research shows that a man called John Heyes discovered the spring on Lower Lane in Whittle in 1836, which has since become Dark Lane. People would visit it for the water’s healing qualities, and the location became so popular that Mr Heyes built a hotel at which visitors could stay, called The Heyes Arms. 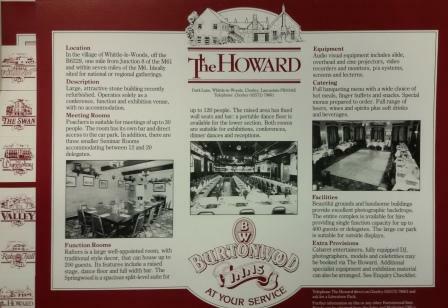 After both he and his brother Henry died, the hotel was taken over and renamed The Howard Arms in 1874. 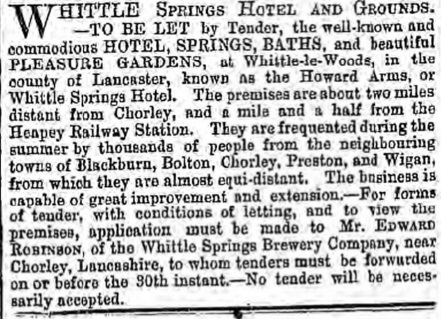 The spring water became popular amongst breweries, pubs in Whittle and Leyland boasted that they sold ‘Whittle Springs Noted Ales and stout’. My grandfather, Joseph Symms and his brother died in brewery accidents in the late 1890s and are buried at the front of the local churchyard in the high street. I wonder if anyone knows anything of these accidents?